I've never been bashful about admitting that I'm not one for Oscar-bait movies. While I do eventually see most of the Best Picture nominees each year, I don't rush to watch them and often have little excitement about the experience. I will admit that I occasionally find myself truly enjoying some of these movies -- The Big Short, Nebraska, Life of Pi) -- but, many of them do nothing for me. I find that so many of them fly in the face of the things which should make a movie good -- imagination, visual flair, escapism. 1992's Howards End is a film which I've certainly heard of, but have never seen until now. Will it find its way onto my "I actually liked it" list? Helen Schlegel (Helena Bonham Carter) is visiting an estate called Howards End, when she finds herself romantically entangled with a man there, Paul Wilcox (Joseph Bennett). Embarrassed, she returns home to London, and her siblings, Margaret (Emma Thompson) and Tibby (Adrian Ross Magenty). Much to their chagrin, Charles Wilcox (James Wilby) gets married near the Schlegel home and the Wilcox's take up residence right across the street. Margaret strikes up a friendship with the ailing Ruth Wilcox (Vanessa Redgrave) and the two do many things together. When Ruth is on her deathbed, she writes a note leaving Howards End to Margaret. Ruth's husband, Henry (Anthony Hopkins), deems the note a nuisance and destroys it. When Margaret and Henry meet socially, they to begin a friendship. Meanwhile, Helen is dealing with a man who has worked his way into the Schlegel's life. Howards End takes place as the turn of the 20th Century and it introduces an idea which has always perplexed me. Much like the families which we've seen in the stories of Jane Austen, the Schlegels present themselves as people who live a comfortable life. The women don't work (I assume because they can't), the families live in a nice house, and they do things like "take coffee upstairs". And yet, they aren't rich. In all of these stories, the clan is on hard times and there are those who are richer than them...but they don't seem to be wanting for anything. One gets the sense that the story wants to make a point about social classes, especially with it's portrayal of the couple who the Schlegels try to help, but things can get lost when those "in need" seem to be doing fine. Those issues aside, Howards End is an oddly-paced movie. I didn't go into it expecting wall-to-wall action, but it often felt that nothing was happening. The movie has a story, but it doesn't seem to have a plot. As Director James Ivory has constructed the film, it is very episodic (this may reflect the structure of the source novel by E.M. Forster). Things happen in each scene, but, even when they eventually come together, they feel like very small parts that never form a larger whole. There are some moments which I supposed could be considered plot "twists", but they aren't entirely shocking and don't do much to move the story along. 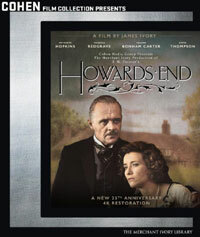 Compared to other films of this sort or even the recent TV success Downton Abbey, Howards End feels very restrained. Perhaps this is an intended reflection of the time period, but dull is dull. This period drama forgot to bring the drama. However, Howards End is not a complete failure. While the story may come across as threadbare and the 2 1/2 hour running time is certainly palpable, the film wins in other departments. The filmmakers have clearly worked to re-created the time period and their efforts have paid off. The film seamlessly transports us to the time period and the film certainly earns the Oscar which it won for Best Art Direction. The attention to detail is very impressive and everything certainly looks authentic. This work must have made it much easier for the actors to get into their roles, as the acting is also impressive. It's clear why Emma Thompson picked up an Oscar for her performance here, as it feels completely genuine. She's always struck me as an actress who makes acting look effortless, and that comes through here, as we never doubt a thing which she is saying. Hopkins is good as the stoic Henry and Redgrave deserves the attention which she got for her work. The only person who seems out of place here is Helena Bonham Carter, but that may be a result of the other roles in which I've seen her. Those who love period dramas may find something to like in Howards End, as this was clearly a labor of love. However, I found it lacking when compared to its contemporaries, as I like a little more passion with my drama. Howards End really shows us the value of an umbrella on Blu-ray Disc courtesy of Cohen Film Collection. The film has been letterboxed at 2.35:1 and the Disc contains an AVC 1080p HD transfer which runs at an average of 35 Mbps. With this release, we get a new 4K restoration. The image is very sharp and clear, showing just a trace amount of grain and no defects from the source materials. It's clear (no pun intended) that a lot of work was put into this transfer. The picture has a notable crispness, which gives it a nice amount of depth. The colors look very good and the image is never overly dark. The level of detail looks good and the image is rarely soft. The Disc carries a DTS-HD Master Audio 5.1 audio track which runs at 48 kHz and an average of 4.0 Mbps. The track provides clear dialogue and sound effects. The street scenes deliver good stereo and surround sound effects, which do bring us some detailed sounds. The film's score sounds very good and fills the speakers. The Howards End Blu-ray Disc contains several extras. The lone feature on Disc 1 is an AUDIO COMMENTARY from critics Wade Major and Lael Lowenstein. The remainder of the extras are found on Disc 2. We begin with three modern-day pieces; "A Conversation between James Ivory and Laurence Kardish, Former Senior Curator of Film, MOMA" (27 minutes); "An Interview with James Iovry and Vanessa Redgrave at the Cannes Film Festival" (8 minutes); and "On-Stage Q&A with Jams Ivory and Critic Michael Koresky at Lincoln Center" (27 minutes). Each of these includes a great deal of insight from Ivory about the film, although some points are repeated. "1982 Behind-the-Scenes Short Featurette" (5 minutes) is a standard EPK with lots of clips and some comments from the cast and the creative team. "Building Howards End" (43 minutes) is a very detailed making of which starts with the history of Merchant/Iovry and then goes through the creation and production of the film. "The Design of Howards End" (9 minutes) has Production Designer Luciana Arrighi and Costume Designer Jenny Bevan talk about their work on the film. "James Ivory Remembers Ismail Merchant" (12 minutes) has the director reminiscing about his producing partner. The extras are rounded out by the ORIGINAL THEATRICAL TRAILER and the RE-RELEASE TRAILER.